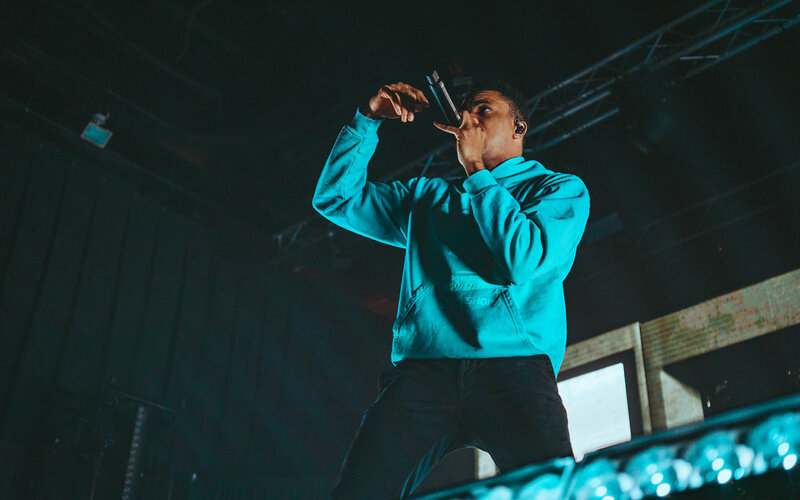 Valentine’s Day was a special night for Vince Staples fans in Fort Lauderdale. Upon arriving to the venue, fans were wrapped around the building and into the main parking lot out front. The “Smile, You’re on Camera” tour featured a large video screen placed at the back of the stage that showed live black and white footage of the crowd and performance in real time. Taking the interactiveness of the show to a new level, fans got to pose, mug, and smile for cameras all night long while singing along to their favorite Vince Staples tracks. The outstanding light show that paired with the video screen made the show larger than life in a smaller capacity venue like Revolution. Since it was a holiday on a Thursday night, all walks of life were present at the show. Superfans, couples, parents and friends were gathered at Revolution Live to see an incredible performance on a Thursday night, which would soon be one like no other. Mosh pits opened up, and the standing GA pit held up an energy that I had never felt in that venue before. The balcony was closed, meaning that the show wasn’t extremely close to selling out, but if you hadn’t noticed that, you would’ve thought every ticket had sold. Vince’s set wrapped with an epilogue, which was a display of Mac Miller’s NPR Tiny Desk Concert. Majority of the crowd stuck around to watch and admire the late rapper, bringing the community closer than ever. After a moving tribute, the crowd applauded an incredible ending to a monumental show.